Preheat oven to 400° F. or 200° C. Cut pumpkin in half lengthwise and remove stem and seeds. Coat with a small amount of oil. Season with salt and freshly ground white pepper. Place cut-side down on baking sheet and roast until soft, about 1 hour. Allow to cool. Scrape pumpkin flesh from skin. Purée pumpkin in food processor and press through a fine-mesh sieve. Retain 1 cup or 250 ml purée for gnocchi. Any extra can be frozen in resalable plastic bags and used for another purpose. In a pot, cover potatoes with salted water, bring to a boil and simmer until fork tender. Drain. When cool enough to handle, remove skins. Pass potatoes through a ricer into a large bowl. Combine potato, pumpkin purée and yolks until smooth. In a separate bowl, combine flour, salt and nutmeg and add freshly ground white pepper to taste. Slowly add dry ingredients to potato mixture. Knead until smooth. Continue as for gnocchi (see basic recipe). Blanch bok choy in a pot of boiling salted water for a minutes. Immediately plunge into ice water to stop cooking. Drain and dry on paper towels. Melt butter in nonstick skillet over medium heat. Add bok choy and season with salt and freshly ground white pepper. Sauté until warmed through. Heat consommé and adjust seasonings. Rewarm gnocchi in consommé. In each of 4 serving bowls place 1/4 cup or 60 ml consommé and some gnocchi. Place two bok choy on top. 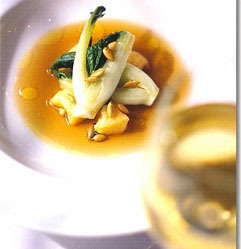 Garnish with pumpkin seeds and drizzle pumpkin seed oil around the consommé.